The Ticket to Ride Card Game delivers all of the excitement, fun and nail-biting tension of the original Ticket to Ride board game, but with several unique game-play twists in a new stand-alone, card game format. You'll collect sets of illustrated Train cards which are then used to complete Destination Tickets - routes between two cities depicted on each ticket. But you'll first face the risk of "train-robbers" forcing you to lose your hard-earned cards. The Ticket to Ride Card Game is the perfect portable way to take your next new train adventure! For full disclosure when I bought this game off of ebay I thought it was the board game, not the card game. That disappointment may have clouded my judgement for this game. That said I gave it a chance to win me over. I played a two player game after reading the rules through a couple of times. I found the rules to be a bit confusing about a couple of components, namely the On-The-Track stack and Train Robbing sections. I feel like the cute names distracted from the clarity of the rules. Also robbing isn’t a correct word since it causes your opponent to discard a train instead of taking it for yourself. The game took us about 45 minutes to play, though it will go faster when we get the hang of it. The mechanics worked and give you some small room for interaction but mostly it felt like we were playing solo games. 10 minutes of the game time was scoring. I had 14 destination tickets to add up and subtract. While it’s not hard math it was still confusing to really keep track of. Once I’m used to it that may change. On the plus side the cards are attractive and feel good in my hand. I liked the artwork a great deal. Typically when I play a game I want to run through it a second time but I was done after one this time. I want to go back and give it another chance but I wouldn’t recommend it to anyone. There are too many good games out there to tell people to spend money on this. Ticket to Ride the card game takes a genuinely great board game and tries to bring it down to a card game. The issue with the game is that it loses the approachability of it’s sire. As written, the game rules are difficult as you try to remember how many cards in what combinations you have saved. It feels more like a mental excercise. I’d imagine that this game would work well for those people who like to play chess blindfolded. It isn’t fun! Memorization feels awful. We have found that the only way to play it is with a house rule that I’ll post on the appropriate page. THis ins not even close to the original. This is more a memory game then anything. And if you are like me, not even remembering who that dude in the mirror is from time to time. Then this game is not for you. It’s confusing and plain contradictory at times. This game isn’t horrible, but it isn’t great either. It’s one of those games that makes a good two-player filler. When my wife and I are tired of Jambo, Castle Panic or Carcassonne, we might pick up this game and play. Would I bring this game to the table with my usual gaming group? No. 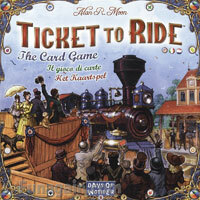 Add a Review for "Ticket to Ride: The Card Game"